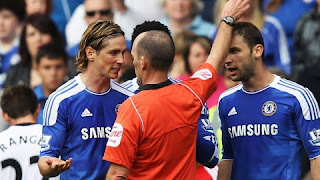 Fernando Torres has spoken of his disappointment at picking up a three-match ban following his first ever Premier League red card. The striker, who had just scored his third goal for the club to put them ahead against Swansea, was given his marching orders six minutes before half-time for an ugly two-footed tackle on Mark Gower. Torres was having a good game at the time, playing a major role in his team's second goal which was scored by Ramires in the 4-1 victory. The Spanish international striker is adamant he meant Gower no harm, even though the midfielder has since admitted that he was lucky to escape injury. On the flip side, the former Liverpool hit-man is now starting to look like his old self, having netted two goals in as many matches and he has thanked the fans for their support during a difficult period in the wake of his £50m switch from Merseyside.